With our high-tech vacuum loading unit, we can extract and dispose of all types of industrial and sewer wastes. 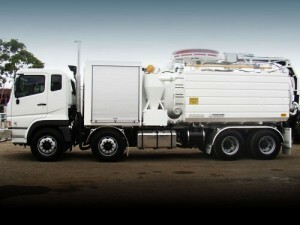 Our tank has an 8,000 litre capacity and the water jet can provide high-pressure cleaning and waste removal as required. In line with our strict environmental policies, waste disposal will be at a registered EPA waste disposal facility.